Retirement clearly is not a priority for far too many young working adults. Large minorities of the 22- to 37-year-olds who responded to a recent LendEdu survey said their retirement saving every month amounts to less than they spend on various categories of consumer goods. Nearly half of them report they spend more on dining out than on retirement saving. Almost one in three spend more on alcohol or new clothes, and one in four spend more on streaming services such as Netflix and Spotify. What that indicates is that a lot of them aren’t saving very much. It might seem unfair that saving for retirement is such an urgent matter for someone not yet out of their 30s. After all, they aren’t earning very much yet, are managing household expenses for the first time, and might have a big student loan payment. But the reality today is that Millennials were not lucky like some of their parents born into a world where they had a decent shot at a job with a pension. And a Social Security check alone is definitely not enough for a retiree to live on. More and more employers are countering a reluctance to save by automatically signing workers up for the company retirement plan – nearly 50 percent of employers are doing this, compared with just 20 percent a decade ago, according to Vanguard’s client data. The idea behind automatic enrollment is that, just as inertia prevents people from signing up for a 401(k), inertia will keep them in the plan if the employer puts them there. 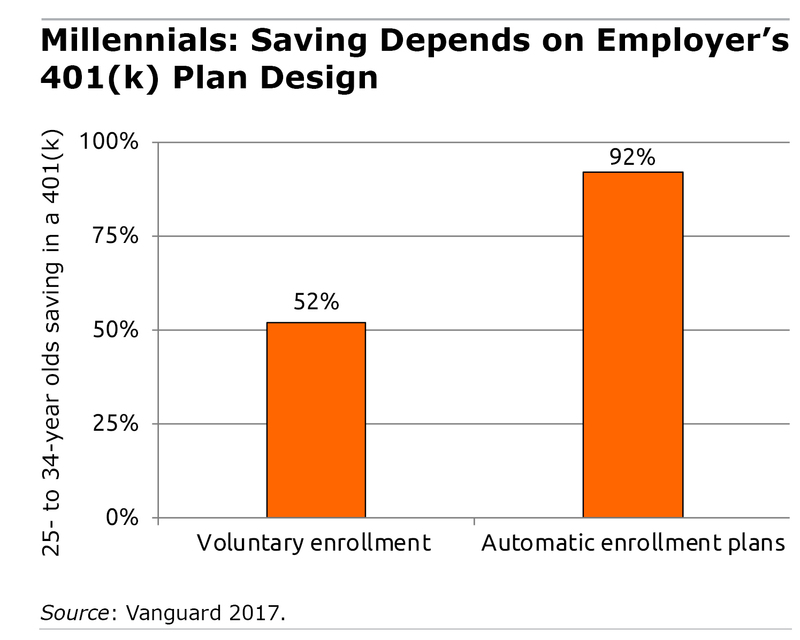 The strategy seems to be working: 92 percent of workers in their mid-20s to mid-30s whose employers have auto-enrollment are contributing part of their paychecks to their 401(k) plans, according to Vanguard. Contrast that to just 52 percent of workers in this age group whose employer plans are voluntary. There’s nothing better than to be young and carefree, but the young adults who aren’t saving are already putting their well-being in old age at risk. Leave them kids alone! Twenty somethings shouldn’t be investing in stocks.They should be investing in finding a good mate. And that costs money. I assume Tony’s comment is in jest, but just in case it isn’t, it should be noted that there’s nothing mutually exclusive about investing in stocks while also looking for a good partner. One of the qualities you hope your future spouse has is the ability to understand personal finances and manage their money responsibly. Someone who’s earning an income AND who has a spending plan that includes saving for his or her future is being prudent. That same spending plan can also have a line item or two that funds their “casting about for a mate” expenses. I’ve encouraged my twenty-something year-old son to take that approach, and thus far it seems to be working fine for him. Because he’s focused on funding both of those goals, he pays more attention to his “entertainment and dating” expenditures than he would if he didn’t have a budget with spending targets for both “fun stuff now” (dates & dining out) and “other stuff later” (retirement). Before we ever met, my wife and I began to save aggressively for retirement shortly after we both started our first jobs. We continued that approach after we met and married. In hindsight that was one of the smartest financial decisions we ever made. We never missed the money we saved and invested,and over the years our nest egg grew to the point that now we can afford to retire without having to worry about our overall financial situation, barring catastrophic health related expenditures and/or long-term care costs. It’s a formula that’s easy to replicate, and starting to save early improves the probability of success later, if you stick to your plan and make sensible investing decisions along the way. I assure you I never joke about anything as serious as money. Let’s start with the lifecycle model of savings behavior. Saving isn’t a goal in itself. The goal is to transfer consumption from periods when your “marginal utility of consumption” is low to periods when you expect it to be high. Now people in their 20s generally have a high marginal utility of consumption. They don’t earn much, they have student debt to repay, and so on. The additional benefit (marginal utility) they will get from additional consumption in oil age isn’t enough to justify the present sacrifice. And compound interest doesn’t change the result. So kids, go out and spend! Millennials face some economic challenges not faced by previous generations. However, they’re also the generation that cause the FIRE (Financial Independent Retire Early) movement to explode. Clearly, there is an eagerness among millennials to save for retirement. However, the economic environment may not support it. It can be difficult to save in your 20’s when you are saddled with student loan debt. It seems to often come back to blaming “student loan debt.” But that student debt came as a result of some very, very bad decision-making. For students (& their parents) to decide to burden these graduates with incredible amounts of debt only for that “college experience” at their favorite university, rather than wisely choosing to go to their local community college (for 1/3 the tuition cost) for their first two years, can’t be overlooked in all this. And to have chosen a career field that might barely stand the chance of affordably paying back the debt. And when they could have saved more by living with their parents while attending the local community college…..(and more, but time is short). Choices matter. Making good personal choices is imperative in a time when bad choices can have a decades-long adverse impact. Yes, many millennials will struggle; many will have to re-prioritize wants vs. needs in a way that you and I (a boomer) didn’t have to. But, if they make better choices in the future they’ll come out of this relatively unscathed and all the wiser. Can’t argue with that Brian!